Size of this preview: 800 × 405 pixels. Other resolutions: 320 × 162 pixels | 640 × 324 pixels | 996 × 504 pixels. 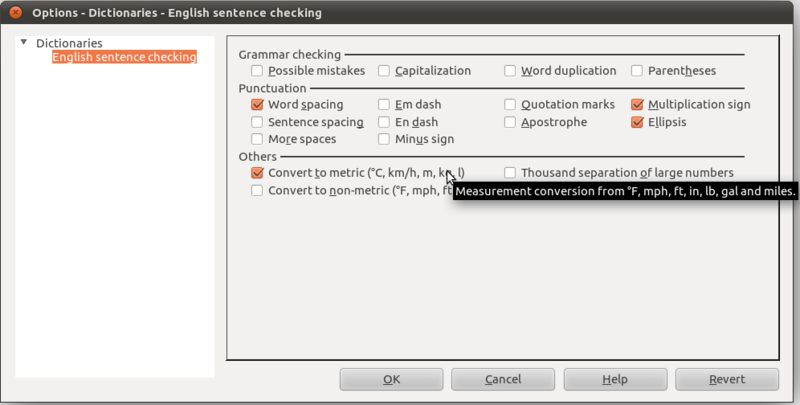 English grammar checker settings – screenshot of Options dialog of English dictionaries extension (see Tools ▸ Extensions). current 2012-02-08T10:54:31 996 × 504 (52 KB) Nemeth (talk | contribs) English grammar checker settings – screenshot of Options dialog of English dictionaries extension (see Tools » Extensions). This page was last edited 16:14:48, 2013-12-04 by Dennis Roczek. Based on work by László Németh.